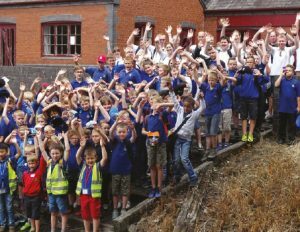 On Saturday 8th July, 120 members from 10 Companies from across the Battalion came together for a day at the Black Country Living Museum. The day started with a Victorian School Lesson, which involved using their slates and chalk for written work. Everybody came together for lunch and a group photo, before going into the mine to learn about how coal was mined in the Black Country. The day concluded with a brief service in the Victorian Chapel led by the Battalion Chaplain. Everyone left having had a great day out with memories and experiences of what life would have been like 100 years ago, when the Junior Section was started.